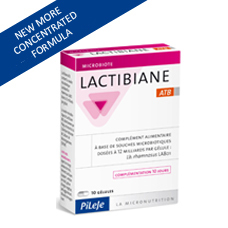 Lactibiane ATB contains a microbiotic strain Lactobacillus rhamnosus LA 801 in the dose of 12 billion bacteria per capsule. The microbiotic strain in Lactibiane ATB selectively bred by PiLeJe is registered in the National Collection of Microorganism Cultures (CNCM). Swallow 1 capsule daily with a large glass of water. Use before meals. Bulking agent: corn starch, lactic ferments (support: corn starch), capsule of plant origin, anticaking agent: magnesium stearate.